This beading tutorial will show you how to weave this bracelet in one continuous path. 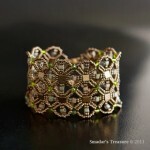 The bracelet can be made in a narrow or wide versions. The materials you will need areTila beads, Japanese seed beads and cube beads and Swarovski crystal bicone beads. A variation of my Tila Twin Wiggle Bracelet pattern that uses size 8 seed beads, Czechmates Tile beads and SuperDuo beads. It is fully illustrated with detailed step-by-step instructions. Free pattern for beaded bracelet Fabiana with tila beads. Tila beads are two-holed beads nicknamed Tila. These beads are a product of Miyuki. With two holes these beads are great for doing ladder stitch. Since ladder stitch requires passing of thread several times into the beads’ hole Tila beads gives the thread enough room to pass several times. Tila beads are also flat and so they are great for making leather wrapped bracelet like Chan Lu bracelets. Tila beads can be used to make any number of beautiful types of jewelry. This About.com video will teach you to make a tila bead necklace.